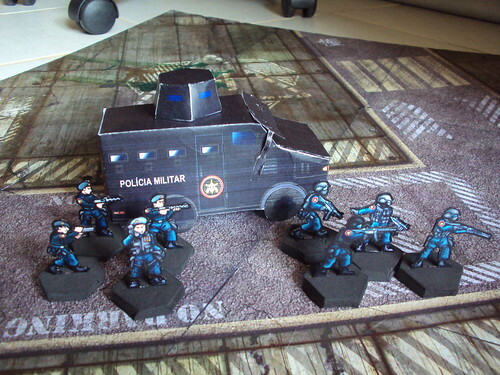 BOPE (Special Operations Brigade) is the Brazilian answer for the SWAT. 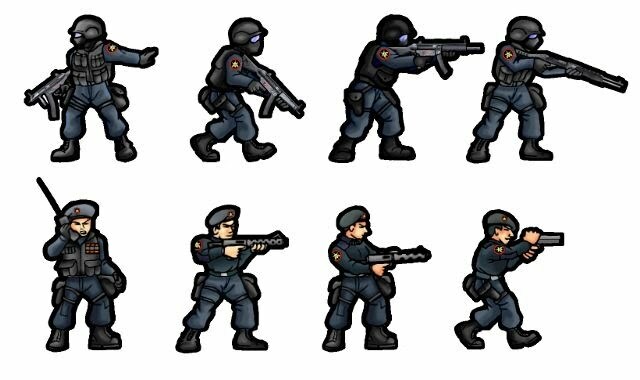 Military Policeman specialized in combat with drug lords, hostage situations and other high risk, high stakes operations. 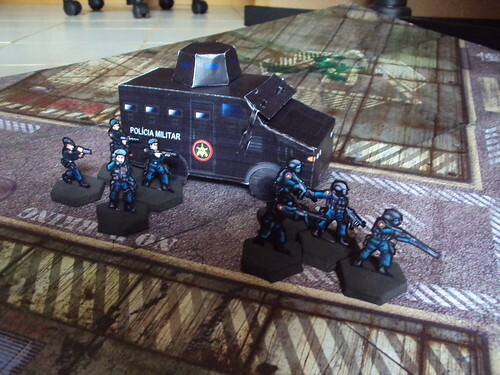 I based them in a SWAT Team by Shadowolf, together with some "UNIT Troops" from him. Mostly a recolor and some tweaks, like the insignia. Nice job! Any plans for a paper model of the Caveirão? 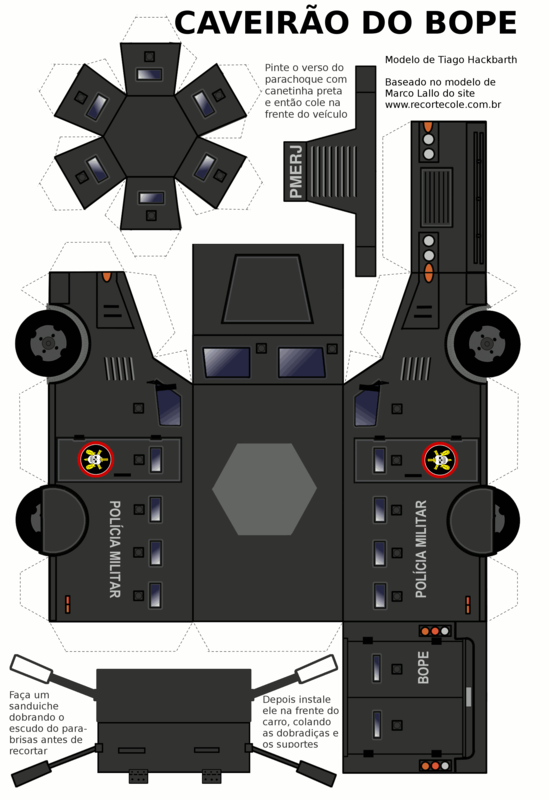 The Caveirão ("Big Skull" BOPE Armored Troop Transport, got the nickname from the insignia of the troop) is in my plans. At least the geometry, I'll ask for help with the textures later, since I'm not good with them. I want some criminal combatants for them. In Rio de Janeiro the Drug Lords are heavily armed but uncharacterized (no uniform or distinctive characteristics). Maybe I'll mod MMIP Showcase #3 Rebels by Lazarus. They are the closest thing, just more more dark skinned and with brighter clothes (we are in Brazil, after all). Update: The Caveirão is almost finished. It's just a mod in one really simple model from recortecole.com.br. Mostly I scaled, added some simple highlights and it was ready. As soon as that is ready, I'll post a update. Not bad at all. I would love to see more in this series. The only thing I'm missing are the true back images. Some photos of the troops and the armored car. I'm no designer, I just modded the minis (without backs) from shadowolf and the car from Marco Lallo. I would love to see some shadowolf minis with backs. His style is excelent and meshes very well with One monk minis (his art is at some point between Jim and Crusiau). 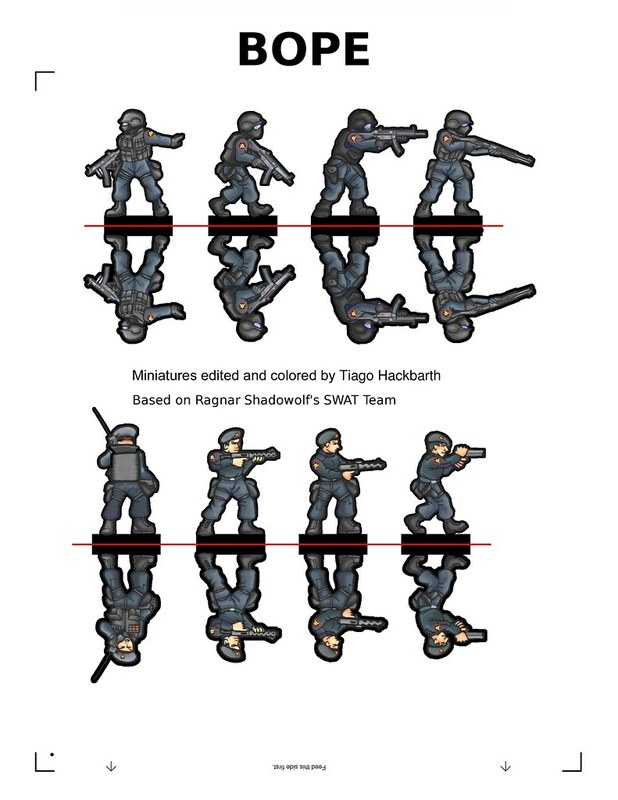 Frankly, there are only a couple of those figures that aren't facing sideways, so backs would only be helpful on a couple of them, unless you are concerned with whether they are right-handed or left-handed. I think they are fine as is. Very nice work! By the way, what are you using for the bases? EVA foam? Black EVA Foam 5mm thick. Cut in hexagons and with a slot in the center to insert the mini. I just made a quick and dirty back for the one with the radio. Is it OK if I post it here? Looks good. Thanks for doing that. Now this will be a challenge to model. Seems not a really hard shape to model in 3D. That'll be a challenge for me to model. If Christopher Roe doze off and fall asleep on his keyboard, just the random keypresses alone would create the model. Myself, that is a different matter. If you did that like I do my models, it should be pretty easy. Maybe I should do that for a Horde release.